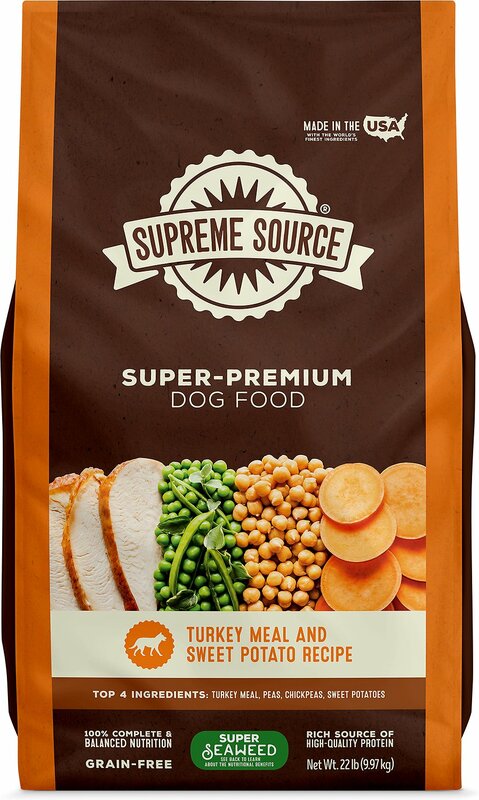 Give your best friend the best in advanced nutrition when you feed her Supreme Source Turkey Meal & Sweet Potato Recipe Grain-Free Dry Dog Food. 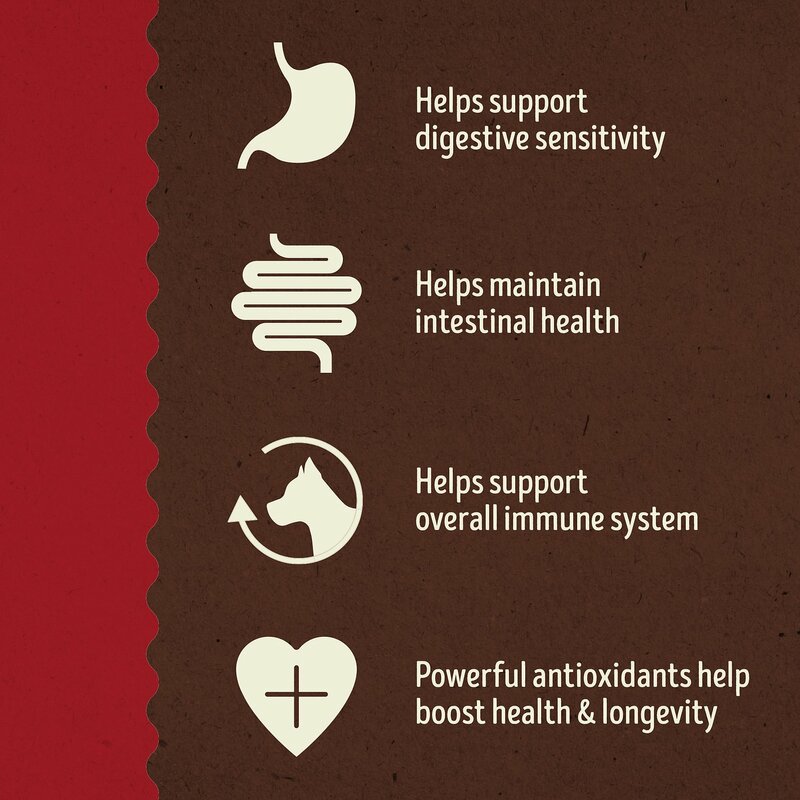 This high-quality food is made using premium ingredients that are sourced, formulated, produced and packed under the watchful eye of family-owned American Pet Nutrition. Turkey meal, which contains even more protein than fresh turkey, is the very first ingredient, followed by real fruits and vegetables that deliver 100% complete nutrition with all the vitamins and antioxidants she needs to thrive. In addition to being 100% grain-free, this food is made without the use of corn, soy, artificial flavors or artificial colors. 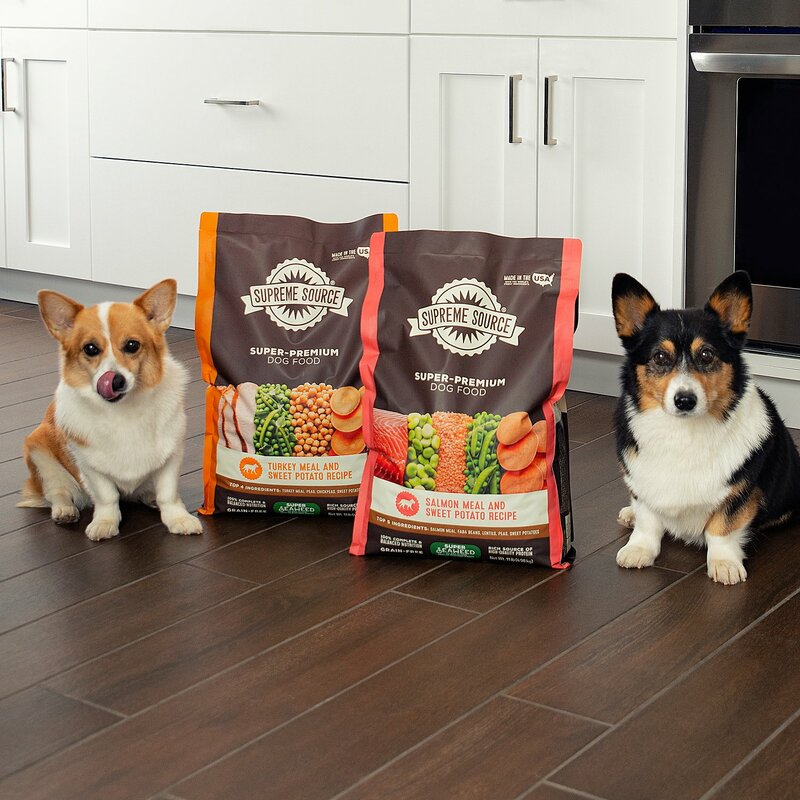 This high-quality food is made with the world’s finest ingredients under the watchful eye of family-owned American Pet Nutrition. Turkey meal, which contains even more protein than fresh turkey, is the very first ingredient. Also includes real fruits and vegetables including peas, chickpeas, sweet potatoes, berries and more. Formulated to deliver 100% complete nutrition with all the vitamins and antioxidants she needs to thrive. New size, same great formula! This product has recently undergone a bag size change. Customers may receive old bag sizes during this transition. 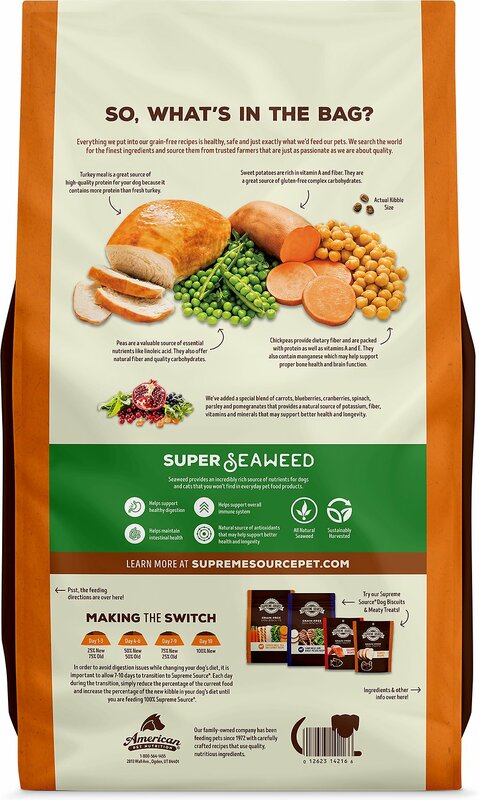 New Formulation: Turkey Meal, Peas, Chickpeas, Sweet Potatoes, Potatoes, Poultry Fat (Preserved With Mixed Tocopherols), Dried Plain Beet Pulp, Natural Flavor, Salmon Oil (Preserved With Mixed Tocopherols), Dicalcium Phosphate, Salt, Calcium Carbonate, Dried Seaweed Meal (Ascophyllum Nodosum), Dried Chicory Root, Betaine, Choline Chloride, Potassium Chloride, Vitamin E Supplement, Carrots, Blueberries, Cranberries, Spinach, Parsley, Pomegranates, Zinc Oxide, Zinc Proteinate, Ferrous Sulfate, Manganous Oxide, Vitamin A Supplement, D-Calcium Pantothenate, Niacin Supplement, Riboflavin Supplement, Copper Sulfate, Manganese Proteinate, Thiamine Mononitrate, Calcium Iodate, Pyridoxine Hydrochloride, Vitamin D3 Supplement, Copper Proteinate, Folic Acid, Biotin, Sodium Selenite, Vitamin B12 Supplement, Cobalt Carbonate, Rosemary Extract. Use a standard 8 fl. oz. measuring cup. 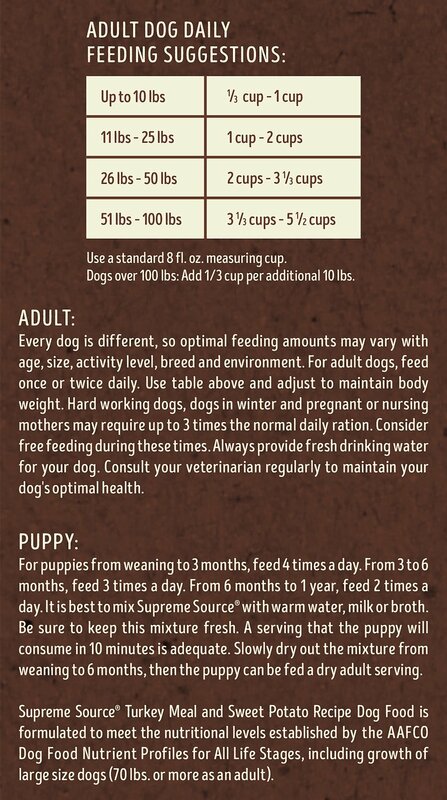 Dogs over 100 lbs: Add 1/3 cup per additional 10 lbs. 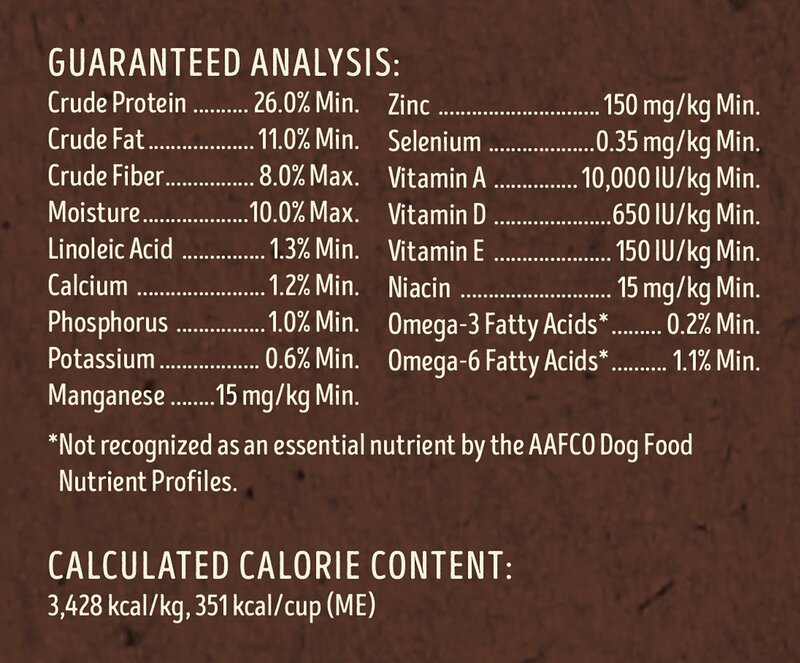 Adult: Every dog is different, so optimal feeding amounts may vary with age, size, activity level, breed, and environment. For Adult dogs, feed once or twice daily. Use diagram above and adjust to maintain body weight. Hard working dogs, dogs in winter and pregnant or nursing mothers may require up to 3 times the daily ration. Consider free feeding during these times. Always provide fresh drinking water for your dog. Consult your veterinarian regularly to maintain your dog's optimal health. Puppy: For puppies from weaning to 3 months, feed 4 times a day. From 3 - 6 months, feed 3 times a day. From 6 months to a year, feed 2 times a day. It is best to mix Supreme Source with warm water, milk, or broth. Be sure to keep this mixture fresh. A serving that the puppy will consume in 10 minutes is adequate. Slowly dry out the mixture from weaning to 6 month, then the puppy can be fed a dry Adult serving. Begin transitioning with 1/4 new product and 3/4 old product for approximately one week. Then increase the ratio to 1/2 new and 1/2 old for an additional week. If your pet is handling the change well, then increase the ratio to 3/4 new and 1/4 old until the old product is gone. If at any time your pet exhibits intestinal distress or other signs that they are not transitioning well, then cut back on the new food and contact your Veterinarian for additional advice. 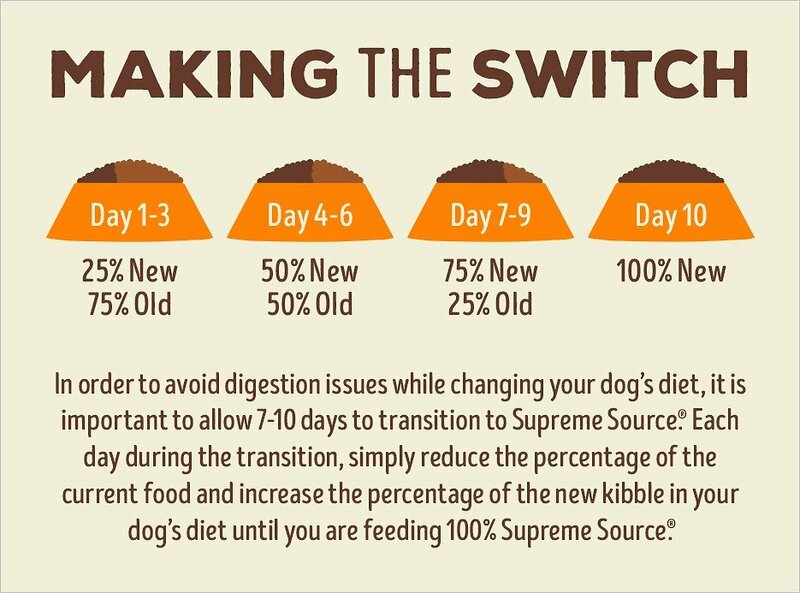 We have to switch up our pup food every time we order because we have some finicky eaters (one dog more than the other) and they get tired of the same kibble month after month (I don't blame them). 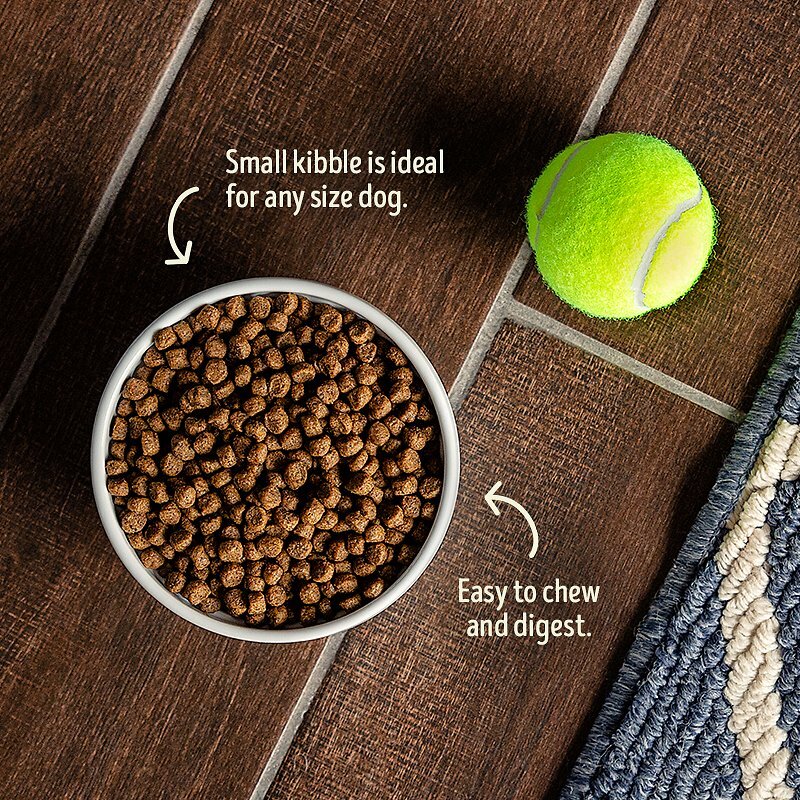 These kibbles are one the small side, so great for little dogs. Our little guy has an easy time chewing and our Medium (Lab mix, 45 lbs) gal likes them too! We still rotate; but this remains in the rotation because it has been pup approved. 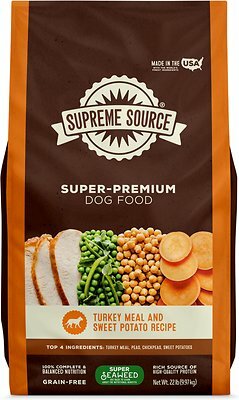 I bought the turkey variety this time believing my dogs would like a change in place of the salmon which they love. Unfortunately they took one smell and wouldn't eat it, even my pig pog labrador walked away from it. No fault of Chewy but had I bought it from a pet store down the road I would have returned it; not sure what Chewy's policy is. 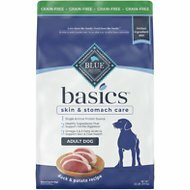 My dog had really itchy skin and I tried a number of foods with no relief. Once I put her on Supreme Source, the itching went away and she LOVES the food. I guess my gang was getting tired of the Supreme Source Salmon, because I mixed this in with it and they loved it.And, it did not affect their digestion or their stools at all. Besides, it was Thanksgiving! 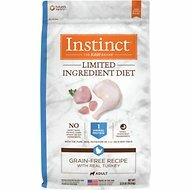 This food is perfect for our small dogs...our Jia has to eat grain free and the size of the pieces are small...they love it! I went through several brands of food trying to find one that both o my dogs would eat. They have been on Supreme Source for over two years and both of them love it! We switched from Zignature Brand because they lost interest in it. The Kibble is much smaller and they seem to gobble it up much better. Very pleased and it was a very easy transition a little mixed in at a time with former food.